My, is Sunday Riley having a bad year. The brand quickly gained a cult following for making products that mix powerful, science-backed actives with natural extracts to give you the best of both worlds. I’m not a big fan of single oil products. I mean, why settle for one oil when a bunch works better? Sunday Riley must think the same. Juno Antioxidant + Superfood Face Oil contains a bunch of non-fragrant oils with moisturizing and antioxidant properties to fight wrinkles and dryness at the same time. The only catch? It takes a while to sink in and doesn’t play well under makeup. Use it at night oil. P.S. Oils are for dry skin. If yours oily, you do NOT need this. You’ve probably heard that Sunday Riley A+ High-Dose Retinoid Serum contains a whopping 6.5% retinoids. Truth bomb: it’s NOT as impressive as it sounds. 5% of that is hydroxypinacolone retinoate (what The Ordinary calls Granactive Retinoid). Brands swear it’s more powerful than retinol… but I have yet to see proof of it. 0.5% is an algae said to act like retinol. The remaining 1% is an encapsulated retinol BLEND – not retinol alone. Retinol is the real deal, the form of retinoid scientifically proven to reduce wrinkles and boost collagen – and there’s not much of it here. Still, retinol works even at incredibly small concentrations, so if you’re just starting your retinol journey, this is a good option. It’s also packed with moisturising ingredients to counteract its drying effect. P.S. If you’ve already graduated to higher doses of retinol (1%>) or are using retinal (retinaldehyde), it doesn’t make sense to switch to this. Related: What’s The Best Form Of Retinoid For You? 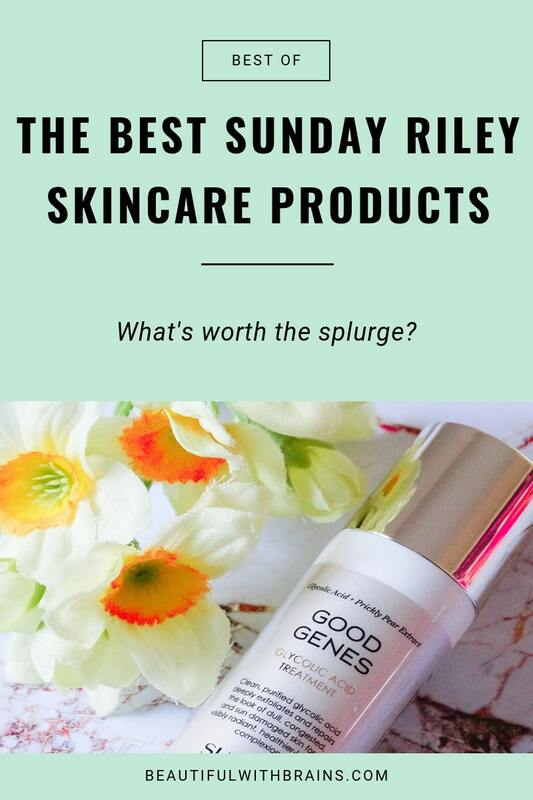 The original Sunday Riley Good Genes All-In-One Lactic Acid Treatment used lactic acid. It’s a gentle exfoliating acid that dissolves the glue that holds skin cells together, so they can slough off and reveal the brighter, more even-toned skin underneath. Lactic acid is so gentle, even sensitive skin can use it. That’s why we were all gutted when the EU told Sunday Riley to reformulate it with glycolic acid. It’s a harsher exfoliant, so not everyone can tolerate it. I now recommend it only to dry skin that’s not overly sensitive or prone to redness. Sulfur is my fave spot treatment for pimples. It kills them faster than anything else I’ve ever tried. The catch? It’s so harsh and drying on the skin. That’s why I don’t recommend using Sunday Riley Saturn Sulfur Acne Treatment Mask all over your face – especially on CLEAR areas. Use it only when spots start to pop up, so they get the message they’re not welcome here, pronto! Bonus points: the mask has 1.5% salicylic acid, an exfoliant that gets inside the pores, removing all the gunk that’s clogging them up and giving you breakouts in the first place. Bye bye, pimples! I know, I know. A lot of you hate the new formula. I totally get it: Sunday Riley Ceramic Slip Cleanser used to be a heavy duty, foaming cleanser for oily skin. Now it’s more of a gentle, milky cleanser for dry skin. The old fans will leave in droves. But I like this new version more. It’s gentle and not as drying as the original. FYI, harsh cleansers only lead to more oiliness and acne in the long run. The real con? It doesn’t remove heavy makeup well. 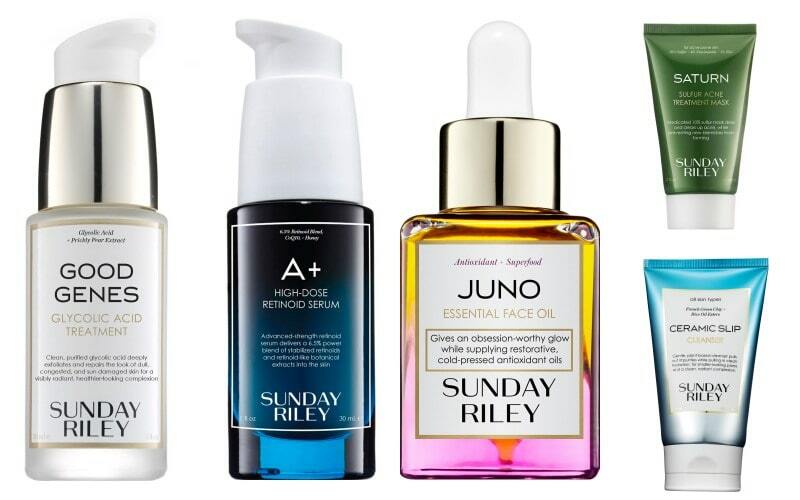 What do you think are the best Sunday Riley products? Share your picks in the comments below. Thanks for this!! I was quite drawn to Good Genes, might give it a go if i can find the original formula. I’m really keen on hearing your thoughts on the brand, Glowrecipe though! I’ve tried a few of their products and like it but not sure how it compares to other brands. Will be interesting to see that. Thivya, glad you enjoyed this. Glowrecipe coming soon!